A unilateral contract is one in which the offeror is bargaining for a completed performance. For example, an offer of a reward to find and return a lost pet is an offer that looks towards the formation of a unilateral contract. A bilateral contract is one in which the offeror is bargaining for a promise to perform. Most contracts which have commercial significance are bilateral. The Brooklyn Bridge hypothetical has been a favorite of Contracts professors ever since it was introduced by Professor Rene Wormser. Typically the hypo goes like this: "A promises B $100 if the latter will walk across the Brooklyn Bridge." Is A bargaining for B's promise to walk across the bridge or is he bargaining for actual performance, i.e., completely walking the length of the bridge? The answer is that A is bargaining for a complete performance. The offer is not accepted and a contract is not formed until B completes the requested act of walking across the bridge. What if B starts to walk across the bridge in response to A's offer but when she is halfway across the bridge, A drops down from the sky in a parachute and shouts "I revoke." Is B's power to accept the offer by completing performance terminated? Professor Wormser originally argued that it was. 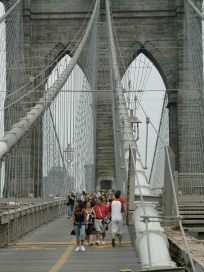 After all, if the only way to accept an offer to enter into a unilateral contract was by completely performing, and the offeror retained his power to revoke or withdraw the offer any time prior to acceptance, then it follows logically that A could effectively revoke the offer because there has been no acceptance until B has walked the entire length of the bridge.